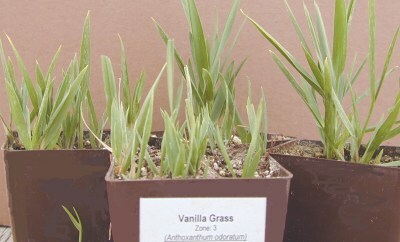 Vanilla Grass is a small yet aggressive perennial grass that is best grown in a container and not allowed to flower. The blades of Vanilla Grass contain the vanilla scent coumarin also found in Sweet Woodruff. The scent and flavor are released when the green blades are dried. Vanilla Grass is especially appealing to dogs. However, like all good things, it should be offered in moderate quantities. Usually letting the dog graze is sufficient control, because the dog knows when he has had enough. Often they go to sleep afterwards. But, then dogs do that, don't they! For more pet plants, read our Prized Pet Plants newsletter.